PROXIMAL HUMERUS RECONSTRUCTION AFTER TUMOR RESECTION: ENDOPROSTHESIS IMPLANT FOR ELDERLY PATIENTS. 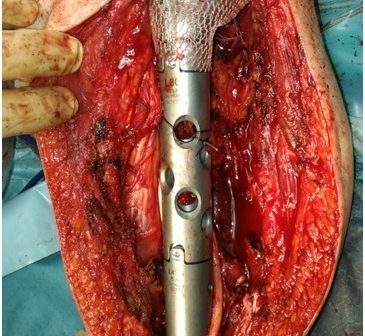 You are at:Home»Embj»PROXIMAL HUMERUS RECONSTRUCTION AFTER TUMOR RESECTION: ENDOPROSTHESIS IMPLANT FOR ELDERLY PATIENTS. Humeral reconstruction post tumor resection is a challenging quest. Reconstruction strategies depend first of all on age and general conditions of the patient, tumor dimensions, local invasion and bone quality. Many kinds of surgery are described in literature, mostly megaprosthesis, hemiartoplasty or alloprosthetic composite (APC) implants or allograft, allograft arthrodesis, clavicola pro-humeri or vascolarized fibula reconstructions. One of the most important goals of this surgery is to achieve implant stability. Surgical planning varies according to deltoid muscle, rotator cuff and axillary nerve conditions. When all these structures are conserved, an allograft or composite (anatomic or reverse arthroprosthesis) reconstruction could be a more suitable option for younger patients. When deltoid muscle function is impaired due to tumoral resection or axillary nerve disfunction, especially in elderly patients, surgeons prefer to implant endoprosthesis. 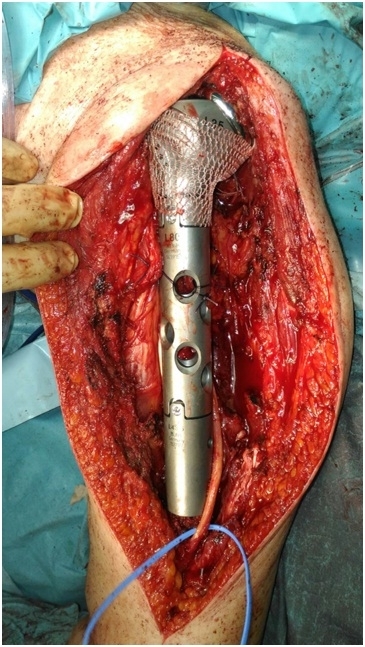 The purpose of this paper is to describe the surgical technique to implant humeral megaprosthesis associated with tendon transfers and tips on how to achieve implant stability.